Sound has 3 demos and is loaded with many prebuilt pages and will suit music classes. 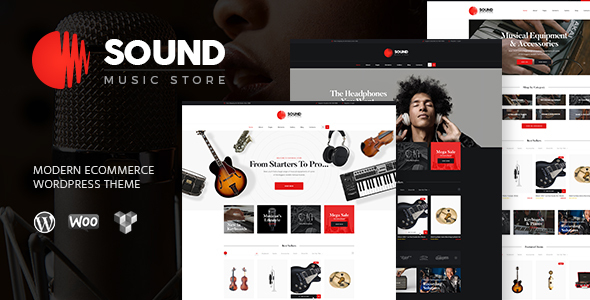 Also it fits music equipment store, karaoke so you can feel relaxed while building your online storetheme. Sound is made compatible with WPBakery Page Builder (aka Visual Composer). Above all, we have made Sound compatible with such plugins, as Essential Grid, MailChimp, Instagram Feed, Mega Main Menu, Slider Revolution,etc. and supplied it with tons of custom shortcodes and widgets. - WooCommerce 3.4.4 support is added. - Child theme is added.